You often hear people say, "You have to be a special kind of person to work with special education students." I vividly remember the day I realized that I was that "special kind of person." I was working with a child who was blind and diagnosed with a severe case of autism spectrum disorder (ASD). We had to make a minor adjustment to his schedule that day, and ended up getting caught outside in the rain. For him, it was the end of the world. Soon, I was dealing with a student having a full-fledged meltdown because he could not communicate his stress and anxiety. This student was not equipped with the skills or tools to effectively communicate with the outside world, and it was my job to help him learn how to do so. Students with ASD often have communication differences that form a barrier between them and their peers. These students have trouble making eye contact and greeting people appropriately. With a lack of communication skills, some students with ASD resort to physical communication and violence to express their needs. Technology has transformed the way we interact with others on a day-to-day basis. In the case of students with ASD, technology has the power to bridge the gap for those who have a difficult time communicating and interacting with people. As a special education teacher at Elgin ISD in Texas, I use a variety of tech tools with students in my district. In many cases, these tools have helped them improve social and behavioral skills such as self-soothing and calming techniques. The first thing that I do with any of my students with autism is to form a trusting bond. These students know when I am genuinely interested in working with them and can sense when people enjoy working with them and when people do not. Some of my most effective ways to relate to students are by playing with their favorite toy, participating in their favorite reading/writing/creating activity and imitating their favorite appropriate behaviors. Once I get to know the student, it gets easier for me to determine what activities and technology tools might be most effective. Our students thrive using technology, which is why our district special education director introduced Milo a few years ago. 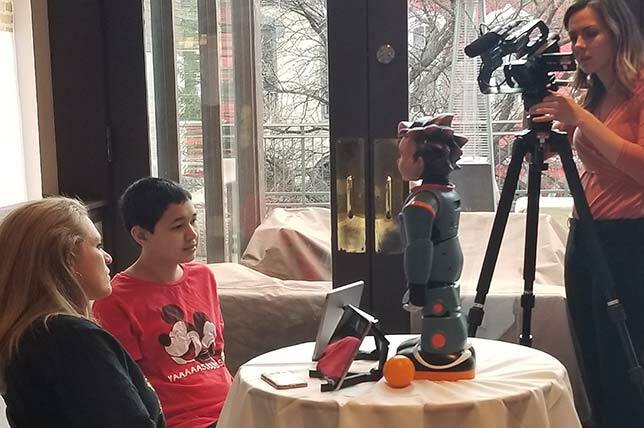 Milo is a facially expressive humanoid robot who is here to help Elgin students on the autism spectrum learn social skills that will free them to interact more effectively with their classmates and teachers. Milo stands about two feet tall, makes a number of facial expressions and can talk, sing and even dance with students. He's designed to be a developmental aid for ASD teaching and learning and is used in conjunction with iPads or tablets. Milo also has a variety of programs that concentrate on different themes, like helping students calm themselves down, greeting other people, take turns and making choices. Using Milo is a non-threatening way for these students to become more comfortable with one-on-one interactions. For example, I use Milo with Abigail, age 14, who used to have difficulty talking, interacting with others and staying focused during some of her lessons. The robot is elevating Abigail's classroom experience. When she engages with him, she opens up, dances and smiles. She knows how to greet and how to say goodbye, which is a huge milestone for her. When asked about Milo and the robots4autism curriculum that comes with him, Abigail's father said, "It has definitely helped her interact and talk and be more vocal." Although Milo is an extremely helpful tool for many, students do not use him every day. We have 14 students in our district who work with Milo two to three days a week. I implement a variety of technology tools based on students' needs. I try to mix up the tools and activities I use, as students with ASD get bored quickly. I use staggered activities that I know the students enjoy, and always allow for time to process between activities. Sensory time can include student-specific sensory input breaks such as deep pressure; skin brushing; yoga breathing activities; vestibular activities (rocking, swinging, jumping, bouncing); classical or other instrumental music breaks; tactile sensory time; and other similar activities. I also use curricula from Texas School for the Blind's Expanded Core Curriculum. They have been very comprehensive and useful for students with autism. As you can tell, I definitely think outside the box when it comes to tool and curricula use. Using technology, students can repeat a lesson multiple times until they have a strong understanding of the concept, or when they want to brush up on their skills. A benefit of using Milo is that he never gets frustrated, which is something not all humans can replicate. He has turned out to be an endless well of patience that creates opportunities that seemed impossible before. One student who has pretty severe physical communication when he is upset — with himself, other people, or objects — is using the calm down skills he's learned from the robots4autism curriculum, like taking a deep breath. We made a laminated card for him with the calm down tools for him to put on his desk, and now he knows to initiate those himself, without being reminded by a teacher. Autistic children often struggle to interpret social cues such as appropriate eye contact and when and how to speak to others. This internal struggle can manifest as severe anxiety. Research from the Callier Center for Communication Disorders shows that individuals with autism start talking to the robots when they don't talk to other people. According to research from Milo's creator RoboKind, kids on average only engage with their therapist 2 percent to 3 percent of the session, but with robots, they engage 87.5 percent of the time. Technology and robotics can ease anxiety for children because they are not pressured to communicate with an actual person. Interacting with technology is fun for students, and the SEL skills they are learning are being transferred into their person-to-person interactions. The key to making strides with students with ASD is to accept that they communicate differently. You cannot use terms like "stop it" or "calm down" with these students. The way they process stress and anger is different. They tend to communicate physically but do not fully understand the consequences of their actions. Technology has helped transform students' social and behavior skills. In a way, Milo is that "special kind of person" designed to provide the patience and understanding that not all humans can provide.